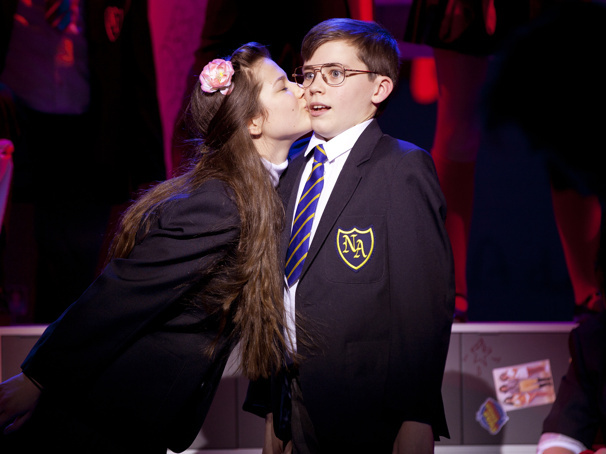 Lulu Mae Pears as Pandora & Joel Fossard Jones as Adrian Mole in the 2015 production of "The Secret Diary of Adrian Mole Aged 13¾—The Musical"
Based on the late Sue Townsend's beloved novel, the musical is a timeless tale of teenage angst, family struggles and unrequited love, told through the eyes of tortured poet and misunderstood intellectual Adrian Mole. The musical features a book and lyrics by Jake Brunger, music and lyrics by Pippa Cleary and direction by Luke Sheppard. The production features choreography by Rebecca Howell, set and costume design by Tom Rogers, lighting design by Howard Hudson, musical direction by Mark Collins and musical supervision/orchestrations by Paul Herbert.